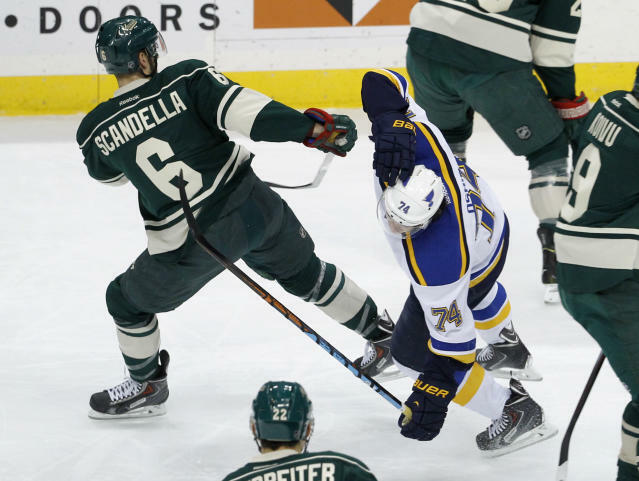 The Minnesota Wild signed defenseman Marco Scandella to a five-year $20 million contract extension. And he celebrated the deal by giving Blues forward T.J. Oshie a violent head shot. Well, I wouldn't call it a celebration ... maybe Scandella was hyped up about the deal so he took it out on the ice? Whatever. Take a look at the hit which sent Oshie, who missed time this year with a concussion, out of the game for a little to get checked out, and sent Scandella to the penalty box for two minutes for an illegal check to the head. In Scandella's favor is the fact that he's not a repeat offender, and Oshie -- who left the game -- returned in the second period. Oh, and also that Scandella is $20 million richer. It's been a pretty good day for him. "This season, he has scored five goals (all go-ahead goals), three of which were winning goals. Five of his 12 career goals are winning goals. That's the fourth-highest percentage of goals being game-winning goals (.417) since 2011. He has also turned into a rock solid defender or as coach Mike Yeo said last week a "heck of an NHL defenseman." Note that the Wild have a nice little young core coming to fruition here between a few guys they've locked up recently in Scandella, Charlie Coyle and Jonas Brodin. Also 'The' Nino Niederreiter is coming on strong this year for Minnesota. And of course they have those two $98 million dollar men in Ryan Suter and Zach Parise who are right in their primes. Someone (humbly raises hand while writing blog) may be taking his medicine this year since he didn't pick the Wild to be any good.